I cooked lamb chops today. And very good they were too. But at the end of Pie Week it seemed right to make a nod towards the humble Lamb Pie. If you are thinking of a Georgian or Victorian scene where the pieman hoists a tray of meat pies above his head as he walks through the London squalor, chances are those pies were lamb or mutton. Beef and other meats were not impossible (particularly round Fleet Street) but lamb was the staple filing, inexpensive and tasty. That was a short side step to pie and mash with liquor. Yes it is eel stock with added parsley. ... but it did have a wider spread. 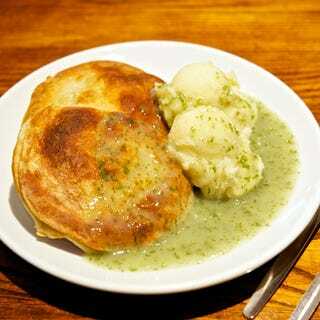 Growing up there were several pie and mash dynasties in South East London. Menzies springs to mind. These establishments had a distinctive decor, tiled walls, wooden chairs and tables that echoed bygone days. Not the Formica top of the Wimpy Bar or Silver Lounge. They are not so thick on the ground these days, though there is a slight renaissance that has gone hand in hand with the gentrification of some areas (which is controversial in itself).